Yohimbe Standardized Extract - 800 mg, 60 Vcaps™ each (Nature's Wonderland) - Penn Herb Co. Ltd.
Yohimbe is the legendary libido booster for increased energy, arousal and satisfaction. The sensual stimulant improves blood flow to the genital area for maximum pleasure and performance! Our extra-strength extract is standardized to 2% yohimbine, the herb's active ingredient. Maintains healthy function; increases desire; heightens energy; boosts performance and satisfaction; promotes blood flow and circulation. As a dietary supplement, take 1 capsule 1-2 times daily, preferably with meals. 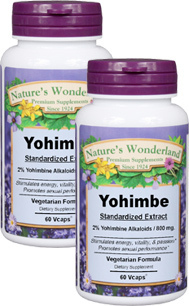 NOTE: Yohimbe's active ingredient, yohimbine may affect blood pressure and heart health. For effective alternatives, see the herbs Muira Puama, Maca, Damiana, and Epimedium. CLICK LABEL FACTS FOR CAUTIONS.